Advantages: First good history of the development of the T-64 in English; many good photos of various developmental and incremental models of the tank. Disadvantages: Probably not enough for some modelers. Nearly 50 years ago the first fuzzy and heavily retouched photos began showing up of a new Soviet tank racing across frozen fields. The West had no idea what it was and so it was simply dubbed the Soviet M1967 Medium Tank. For nearly 15 years NATO had no clear idea of what kinds or types of tanks the Soviets had and so most of them were simply given numerical designators like M1981/3 or M1983/1/. It was only in the mid 1980s that they found out the Soviets had not one but three nearly identical tanks, now classed as main battle tanks. The precursor of all this turned out to be the T-64, a tank whose design history began in 1952 when per their military regulations the Soviets began searching for the NST - a Russian acronym for New Medium Tank. This was due to the fact that the brand new T-54 Model 1951 tanks were finally entering mass production and being fielded to units, so a replacement needed to come up on the drawing boards. The prime candidate to create this tank was Aleksandr Morozov, who had taken over the Kharkov design bureau in September 1940 following the death of Mikhail Koshkin. He had been the chief designer when the bureau moved to Nizhniy Tagil a year later and through the wartime and early postwar years. But by this time he was now the chief of the design bureau for Factory No. 75, relocated to Kharkov. Morozov then came up with a revolutionary design called Article 432. This tank was to use the same gun but with separate loading ammunition and a new autoloader that replaced the human loader. With a crew of only three the turret could be made smaller with thicker armor and the tank made lighter. This used an improved engine design, the five cylinder 5TD, which would take until the mid 1980s to perfect and cause most of the headaches with the T-64. The “sugar daddy” for the T-64 program was Dmitriy Ustinov, who was then the secretary to the technical committee of the Politburo Central Committee. He loved new “toys” and put all of his support behind the new design. While under development the British introduced the new 105mm L7 gun which soon became the NATO standard tank gun. The Soviet leadership was irate about having an “inferior” caliber and as a result with some experimentation the D-54TS was bored out and became a 115mm smoothbore. This gun, the D-68 or 2A21, was selected for the Article 432 and became its armament. The Article 432 entered very low rate production in 1964 but it was not until the end of 1966 when it was accepted for service and designated the T-64. But while nearly 2,000 were eventually built, they were considered maintenance nightmares and “hangar queens” by the troops. Morozov was continually having to upgrade the tanks and rework everything, especially the engines, and as a result there was little standardization from year to year of production. A vastly improved but still imperfect tank came out in 1969 as the T-64A. This upgraded to the end item desired by all of the Soviet commanders, the 125mm D-81T smoothbore gun. From the designer’s standpoint it was a “drop fit” into the T-64 tank, but the tanks still had engine problems. Ustinov had ordered that the T-64A would be the new standard tank and be built at all Soviet tank plans, but due to political reasons and regional animosity neither Nizhniy Tagil nor Leningrad (whose production facility was now at Omsk) agreed to that. Kartsev was told to design a simpler version tank for wartime production and export using a V-2 type engine, and Leningrad was tasked with a turbine powered variant of the T-64A. Both factories did so, but heavily modified their designs as the Article 172M from Kartsev and Article 219 sp 2 from Leningrad (Nikolay Popov). Ustinov was furious at Kartsev and had him moved to a deadend job as punishment, but his tank went on to become the highly successful T-72/T-90 series tank. The Leningrad tank became the T-80 series, fast and powerful but a complete fuel hog as many specialists had noted at the time. Finally the ultimate T-64 came out in 1976 - the T-64B with the additions of a laser range finder/fire control system and the 9M112 “Kobra” through-the-bore antitank guided missile system. These tanks were called “sniper” tanks when introduced due to the fact the missile was accurate to over 4,000 meters. But by this time the T-72 was into its A Model and the T-80B model with the same missile was being prepared for production. By 1985 the T-72B with its better 9M119 laser-guided ATGM and the T-80U with its improved engine and the same missile were being fielded. After Ustinov died enthusiasm for his tanks did too, and the Soviet Army began to move them to depots for “wartime reserves”. With the breakup of the USSR, the Russians quickly sent all of their T-64s off to storage but due to national pride the Ukrainians kept up development with the T-64U Bulat and T-84 Oplat. But production of these two tanks has been quite modest. There is no good set of numbers for T-64 production but when the Conventional Forces in Europe Treaty was signed in 1990 there were 4,900+ T-64s in Russian service west of the Urals. Most are now scrapped with only about 2,000 still in depots east of the Urals. 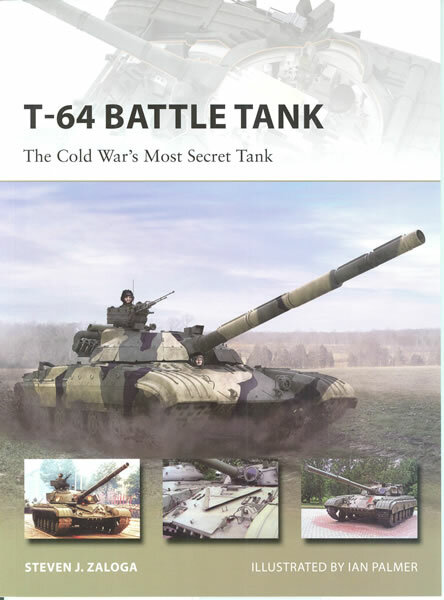 Steve Zaloga has done a great job of getting the convoluted history of this seminal main battle tank down to 48 pages and giving as much information on its history and development as is currently possible. As a point of full disclosure, I did a good deal of the translation support for the material used in this book, so am very happy to see it correlated and presented in a handy format. Modelers may be disappointed it does not have a “blow by blow” account of each incremental change in the design or plans of the vehicle for modeling purposes, but it does offer a very good set of photos of many different versions and a few odd ducks like the MT-T carrier and BREhM-64 repair and recovery prototype. Overall if you are a fan of Cold War and Soviet armor this book is a “must read”.